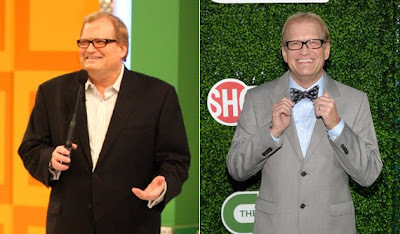 Drew Carey cut out all grains, starches and sugar, and has lost 80 pounds as a result. "No carbs," he said. "I have cheated a couple times, but basically no carbs, not even a cracker. No bread at all. No pizza, nothing. No corn, no beans, no starches of any kind. Egg whites in the morning or like, Greek yogurt, cut some fruit." Carey's also no longer diabetic, and attributes this to his new approach to eating. "I'm not diabetic anymore. No medication needed," he said. Another benefit: "I like being skinny. I was sick of being fat on the camera. Really, I just got sick of it." I wouldn't be surprised if a dog-eared copy of "Good Calories, Bad Calories" is on Drew Carey's nightstand.